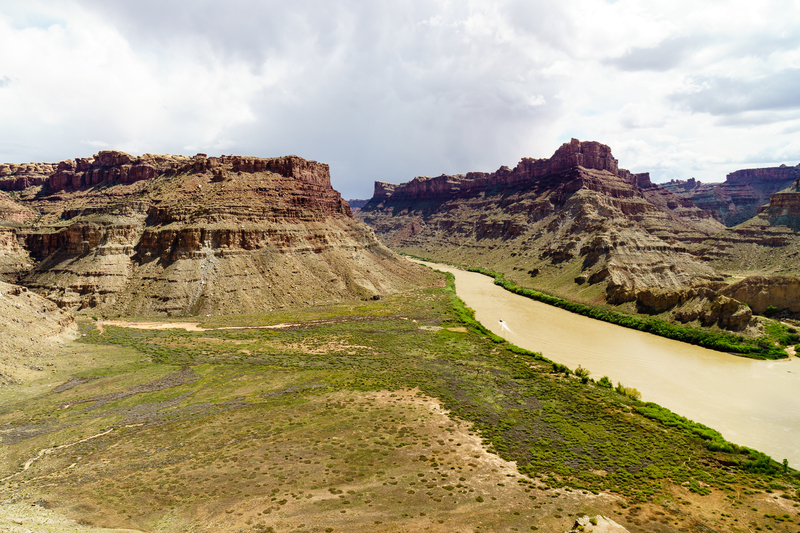 When John Wesley Powell led his exploratory trip down the Green and Colorado rivers in 1869, every member of his party reported passing the most “terrible” rapids just about every time they went through a canyon. From their first major portage at Ashley Falls in the Green River’s Flaming Gorge (later called Disaster Falls by Powell) to the relentlessly continuous rapids that led to the loss of a boat in Lodore Canyon, every obstacle they faced was worse than the last, and Cataract Canyon was no exception. 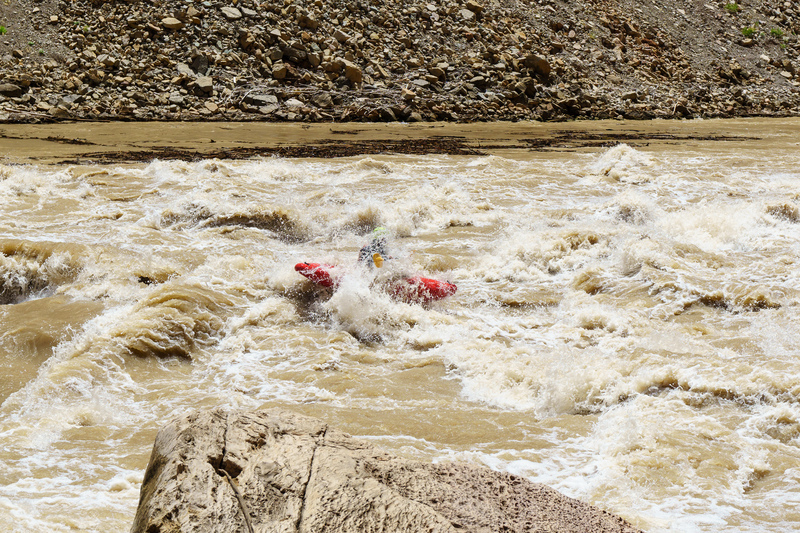 Some of this was hyperbole and fear of the unknown, but some of it was legitimate — the canyons really do seem to grow in difficulty as the river cuts its way downstream. Peter Robertson in Big Drop 2 on Cataract Canyon in Utah. On top of being an explorer, “ethnographer” (anthropologist), bureaucrat, and Renaissance man of the American West, Powell was the grandfather of modern-day geology. He and his colleague, G.K. Gilbert, defined — essentially from scratch — our understanding of the Colorado plateau, the Colorado river, and geomorphology as a science. 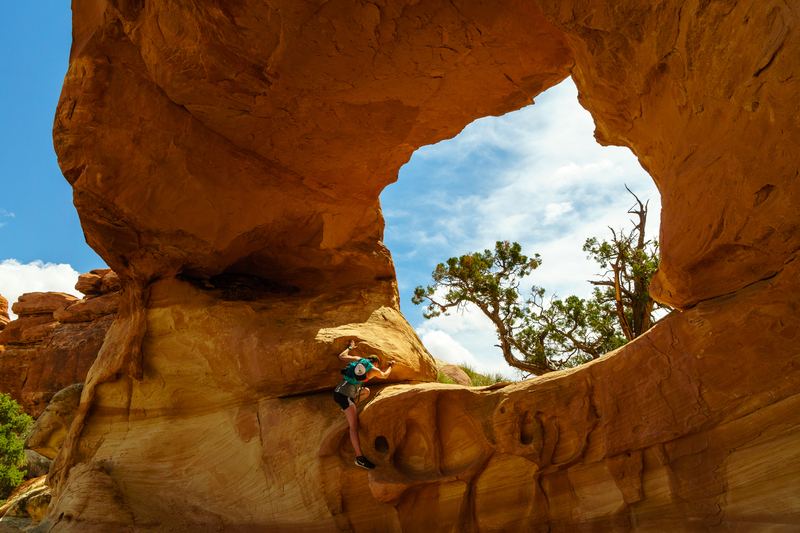 Natalie Sands explores some geology in the Maze district of Canyonlands, an area most easily accessible from the river. In March this year, I joined a group of geomorphologists from Utah State University in their own scientific exploration of the Green and Colorado Rivers, floating Stillwater and Cataract Canyons. In homage to our historical counterparts, we brought plenty of whiskey and bacon, but laid off the dried apples and replaced the barometers with GPS units and aluminum tubes for collecting samples that would later be tested to determine the approximate timeline of the formation of physical features on the banks were formed. While our trip was just one of many down Cataract this year, it was the inaugural voyage for all of us, and for the Utah State University Geology Department’s newest science collector, a 14’ raft now known as “The Salty Toad,” a reference to the Paradox Formation salt that is a critical part of the geology of the greater Moab area and Cataract in particular. As a kayaker first and rafter second, I’d always bought the common refrain that Cataract is generally “not worth it.” “10 minutes of rapids and five days of flatwater” is what most people tell you when you ask about it. So, for sixteen years of river running, and two years of living right nearby in northern Utah, I shied away. Cataract is for rafters, I thought. Rafters with motors on their boats, at that. A group of paddlers paddle past on their way from Mineral Bottom to the confluence of the Green and Colorado rivers. If you’re solely motivated by whitewater, then perhaps that assessment remains accurate. But if you’re solely motivated by whitewater, I’d posit that you need to reassess your motivation. Kayaking — for me — is as much, if not more, about the places it takes me than about the rapids. Philosophy aside, Cataract blew me away on every level. The scenery is every bit as stunning as the Grand Canyon and it takes you through some of the most remote places in any national park in the US. Floating the river grants access to places that would otherwise require a day’s travel in a 4×4 jeep — just to get to the trailhead. The Dollhouse, in particular, blew me away — Moab-style arches and slickrock abound in this area deep within Canyonlands’ Maze District, but there are no crowds, RVs, or rental jeeps. It’s just a thirty minute hike up to the canyon rim from Spanish Bottom at the confluence of the Colorado and the Green. Side-canyons and other hikes from camps provide spectacular vistas over a canyon far more raw and geologically active than Grand Canyon. One theory is that, unlike the Grand Canyon where the majority of rapids are formed by debris fans from side canyons, most rapids in Cataract are formed by rock fall from the actively changing canyon walls. The activity is — at least according to my geological compatriots — largely due to the kilometer’s worth of salt underlying Moab which is rapidly dissolving, causing the canyon on the surface shift. Looking upstream towards the confluence from Spanish Bottom, at the head of Cataract Canyon. Because they’re not formed by debris fans, the rapids in Cataract come in fast succession. They may only span 20 miles, but at our flow (about 22,000cfs), they made for exciting and fun read-and-run big volume class III-IV. The naming system leaves a lot to the imagination — rapids are numbered — but the distinction of three rapids as “Big Drops 1, 2, and 3” builds anticipation. We ran Big Drop 1 without scouting — a long, bouldery affair with multiple moves and fun wave trains — and pulled out to scout Big Drops 2 and 3, apparently a sight of so much trouble that, in the busy season, the Park Service stations rangers in motor rigs in the outflow to clean up carnage. The description in one of our guidebookes described these as “Crystal and Lava stacked on top of each other” — I don’t think I’d go that far at our level, but it’s certainly plausible that as flows approach 50,000 (or higher), these rapids give the Grand’s largest rapids a run for their money. A technical entrance to Big Drop 2 leads quickly into a technical exit and the tailwater flows into a boulder-strewn Big Drop 3 with a narrow line for rafts. Commercial guides have bestowed intimidating names like “the Claw” on each feature in these rapids; if you’ve got a couple minutes, Youtube provides some very entertaining couch-scouting visuals. After the Big Drops, the rapids quickly mellow as you approach the sediment-laden quickwater that marks the rapidly receding line of Lake Powell. We had current all the way through the Navajo Bridge at the head of the lake, but in years when the lake is higher, you may be rowing — or motoring — through completely still water. That said, this section flows through Narrow Canyon and the name is not misleading. The Colorado passes through a sheer-walled gorge that, from within, appears deeper than the Grand’s Inner Gorge, making the flatwater float tolerable — even enjoyable for many. The only major issue is that between the steep canyon walls and the muck that Lake Powell leaves behind as it recedes, camp options in this reach range from limited to nonexistent. We spent one night on a brushy sandbar that only had room for half our kitchen, but it could’ve been worse, and with better planning, you could camp just above the Powell sediment and make a one-day push to the takeout from there, even with human-powered transport. Whether for science, recreation, or both, Cataract Canyon represents one of the best wilderness experiences available to recreational river-runners in the lower 48. 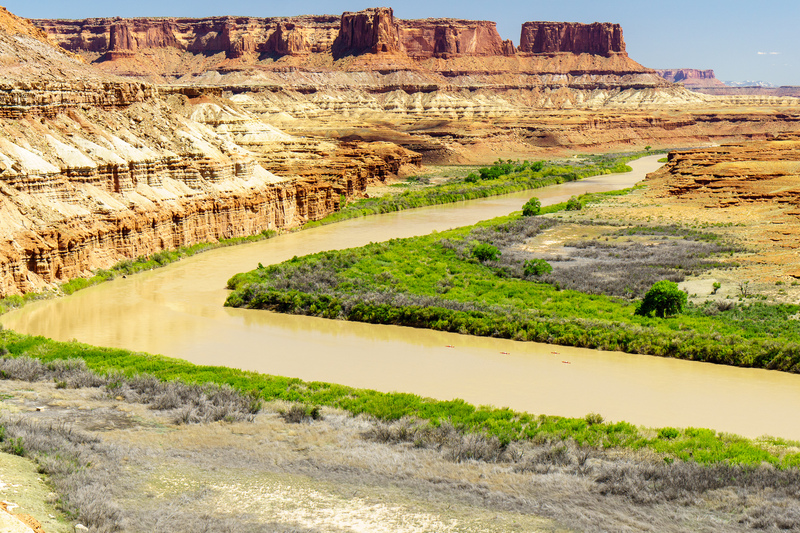 Permits are easy to come by, logistics are simple, and it provides access to parts of Canyonlands that are practically antithetical — in a good way — to the typical paved, RV-ridden National Park experience. While you’re there, remember to think back to John Wesley Powell’s 1869 exploratory trip, pioneering uncharted regions of the American West and unintentionally giving birth to the sport we all enjoy. This post first appeared on the CKS blog in February, 2017.